In January of 2008 Owen Ogletree and Don Beistle flew into Munich for a quick visit. Don Beistle writes the Ask Dr. Brewski Q&A column for Southern Brew News and knows most everything about Bavaria and Germany, but had never been to Europe until this trip. It was a fantastic visit filled with German Pilsners, Helles, Dunkels, Weizens and Dopplebocks. Print this page out and head to the land of Reinheitsgebot (the German beer purity law) as soon as possible for a beer experience that you won't soon forget. If you have experiences with any of these locations that you'd like to share, Owen always welcomes your e-mail and input. 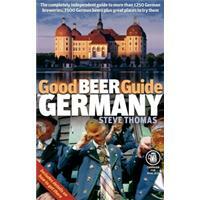 Be sure to also check out Owen's beer guide to Munich, Regensberg and Kelheim from 2003. This essential guidebook is available from CAMRA. Probably one of the most famous public bars in the world, the Hofbrauhaus has the unique ability of appealing to tourists, locals, and beer fans while still maintaining a pleasant atmosphere of a big Bavarian beer hall. The regular beers here include a Pilsner, Helles, Dunkel and Hefeweizen. Strap yourself on to your bench, as the delicious beers are only available in liter mugs. Order a plate of sausages with your liter or buy a big pretzel from the strolling pretzel girls, and be sure to sit close enough to hear and see the fantastic Bavarian band. If a table is marked as Stammtischs, this means that it is reserved for local regulars. Just across from the Hofbrauhaus, this relatively new Ayinger pub is quite possibly the most attractive modern-style beer pub in Munich. The Ayinger Brewery is located just a few miles outside of Munich, and the full range of Ayinger products is offered at Ayingers am Platzl. The wooden paneling and custom leather seats and benches are very pleasing to the eye. Ask about the current seasonal beer or sample a rich and delicious Celebrator Doppelbock. 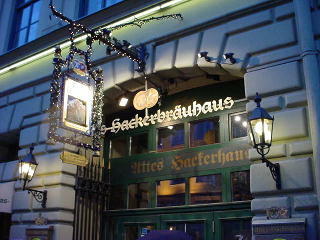 This authentic pub is tucked away next to the Frauenkirche Cathedral very near central Marienplatz. It is a beautiful tavern that is filled with old world charm, great beer and food. Try the house specialty Nurnberg sausages that are grilled over an open flame. The refreshing Helles is offered from wooden barrels behind the rear bar. Just across the walkway from the Nurnberger Bratwust house (above), next to the cathedral, is this pleasant Andeschser pub. 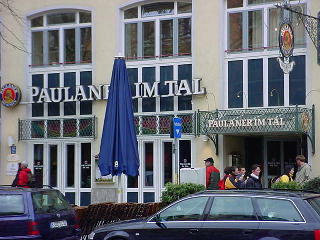 The place is clean, attractive and very busy with locals who come to enjoy the beers and Bavarian food items. Try the tasty Andechser Dunkel and Pilsner. This upscale pub is located on the busy street of Im Tal just to the southeast of Marienplatz across the street from the Schneider Weisses Brauhaus. It features the full range of delicious Paulaner beers made at the large Paulaner brewery in Munich. The Paulaner Hefeweizen (wheat beer with yeast) and bottled Salvator doppelbock are heavenly. There is a small, attractive bar up front with large dining areas to the rear of the establishment. This tavern was once home to the famous Schneider wheat beer brewery until a bomb in WWII put an end to brewing operations. The brewery is now located in Kelheim. The large and beautiful Weisses Brauhaus now serves up delightful German food along with the impressive, dark wheat beers from Schneider. The menu includes the standard, rich German dishes of Bavaria and also features vegetarian and fried fish selections. It is great fun to watch the bartenders fill the half-liter glasses of Schneider Weisse - and they are more than happy to mug for your camera (as you can see from the photo above). This location was home to a brewery in the 1500's and now is a tavern that features the outstanding beers of Hacker-Pschorr. The walls are decorated with memorabilia from the brewing past of Hacker-Pschorr, and the beer selection features the Helles (a golden lager with a malty flavor), Dunkel (a darker lager with caramelized malt flavors), Pilsner (a light colored lager with a spicy, hoppy profile), and occasional seasonals (such as the excellent Animator Doppelbock). Interesting food is served all day -- including calf's lungs, roast pork, suckling pig in beer sauce, and a wide array of sausages and other wild game and organ meat. Located just a five minute walk from the Altes Hackerhaus (near the Viktualienmarkt), this new Pschorr pub offers a more modern interior, a central bar with Helles served from a wooden barrel, and "slow food" items from the specialty menu. There is an upper floor and an artsy widescreen television displaying still photos. This is one of the most inviting and authentic of all the Munich taverns, and it features the fine beers of the Augustiner Brewery. The Maximator Doppelbock is a dark, chocolately, malty beer with quite a kick. 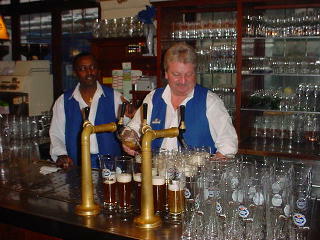 Helles, Dunkel, and Wheat beers are also offered. 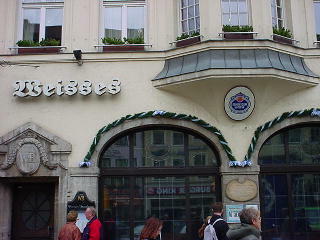 The tavern is located on the central pedestrian shoppin street that runs east toward the Marienplatz. The brewery has not been located here since 1885, but the place still drips with personality and history. Hearty, traditional Bavarian fare is served all day.